My boyfriend has gone away for a week and whenever he's away I take the opportunity to eat as much seafood as I can since he's not a big fan. I know...crazy right? But shellfish is not commonly used in the cuisine of many Eastern European countries of course (many land locked countries). However! it's only a matter of time before I eventually convert him, heh heh! This seafood indulgence has to be one of my favourites. Mix a creamy sauce, pasta and shell fish and I am in heaven!! Another reason this is such a treat for me is because scallops cost and arm and a leg here in the UK. I think it might even be the first time I've had them since living here....over 5 years is way too long! - Melt butter in a saucepan, add 1/4 of the crushed garlic and the spring onion. Saute for a minute on a low-medium heat, but be careful not to allow the garlic to burn. Keep strring. - Heat olive oil in a pan and add scallops. Cook for 4 minutes on each side. - Mix sauce with the pasta. If necessary, add some of the reserved pasta water to loosen the pasta and sauce a bit. Divide up onto 2 plates and top with scallops and prawns. Yummm!!!! I am also sharing this dish with the week's round up of Presto Pasta Night, hosted by Kait of Pots and Plots. Check it out and I'm sure you won't be disappointed with all the lovely pasta dishes being shared. This sounds delicious! Love the seafood/alfredo mix and YES you need to convert the bf. Seafood is too good to miss! Mmmmm, good idea to add scallops and prawns to the Fettucine Alfredo!! Unfortunatly, I'm with the bf on this one. You and my hubby would have a lot to commiserate about! :) stopping by from PPNs. What a total drool fest! As for your boyfriend...all the more for you! 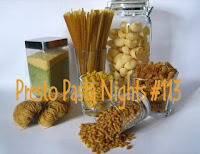 Thanks for sharing with Presto Pasta Nights...keep those delicious dishes coming our way!